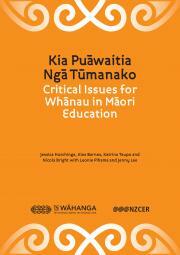 This report presents the findings of a kaupapa Māori research project that identifies diverse whānau aspirations in Māori education. We asked a variety of whānau the question: What sorts of educational research would be of benefit to your children and whānau in education? The whānau responses to this question have resulted in refining a Māori-led and whānauinformed research agenda for Te Wāhanga, the kaupapa Māori research team within the New Zealand Council for Educational Research (NZCER).